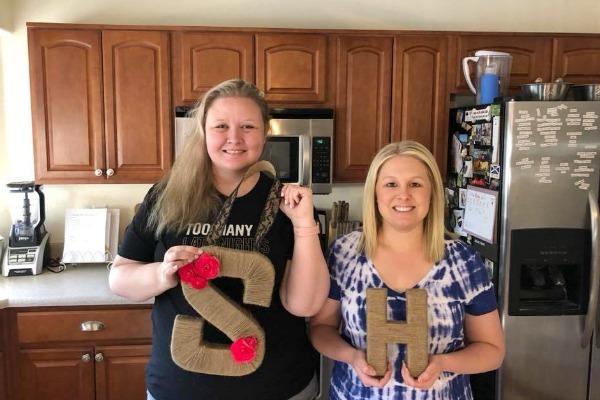 On Saturday my friend Michelle and I had our monthly craft day, so today I wanted to share a recap of our most recent projects. If you want to check out any of our past projects, I put together a list at the bottom of the post. In April, we made spring pillow covers (you can see our fall covers here and winter ones here). 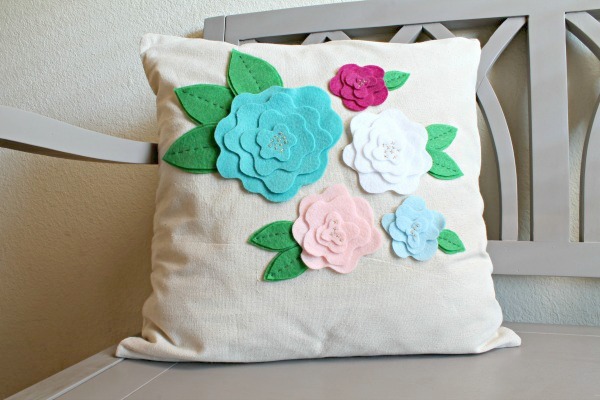 For these we just buy premade burlap pillow covers from Hobby Lobby and decorate them with felt. The covers are only $5 and they have a zipper, so it’s definitely worth the money to buy vs. sew ourselves. As you can see, we both went with a flower theme, but with different pillow inspiration. This picture was my original inspiration, but I couldn’t find the right fabrics and colors, so I ended up just free handing some flowers and trying different layouts. 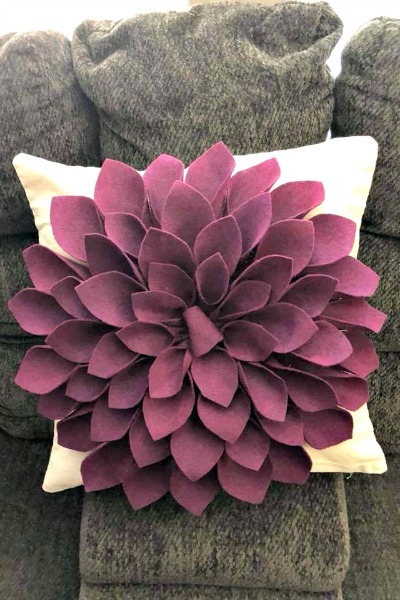 Michelle made her using the chrysanthemum pillow tutorial from H is for Handmade. Although she hand sewed all of her petals instead of gluing them, so she had to finish hers later that night. I love how both of them turned out! For our May craft we made twine wrapped letters. The S is for Michelle’s last name and the H is for mine (and Adam’s). This project was pretty easy, but was super tedious. We followed these directions from Chelsea at two twenty one, but it’s a pretty straightforward project. Hot glue, wrap twine, more hot glue, and more wrapping. Michelle made hers into a wreath for their front door, but I left mine plain so I could use it on my shelves. 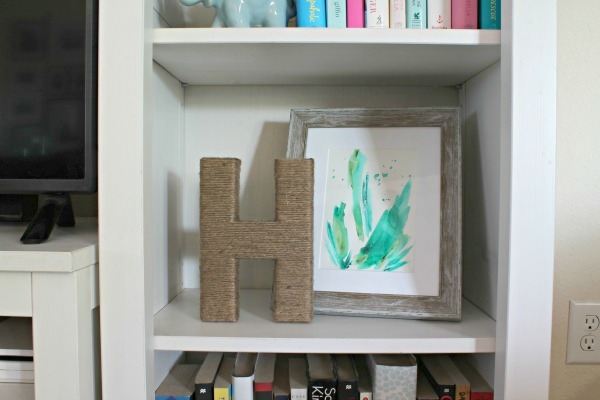 I’ve been wanting to add an H to our bookcases forever, so I was really excited with how this project turned out. This month we mixed it up a little bit. We decided to each pick a craft using leftover supplies from a previous project. We’ve accumulating quite a bit of stuff since we started craft night (plus I already had tons of supplies), so it was time to do a little clearing. 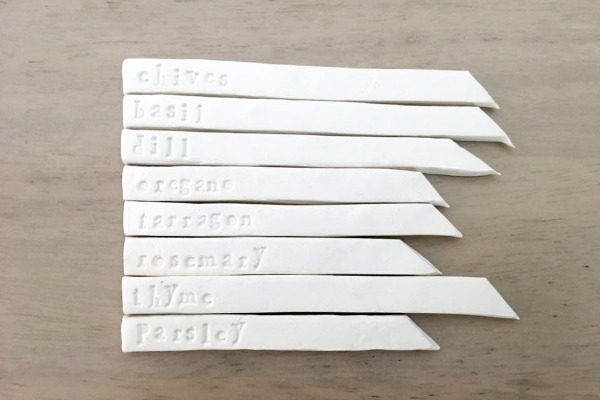 For my project I decided to use the leftover clay from our November 2016 Christmas ornament craft to make herb markers for my garden. 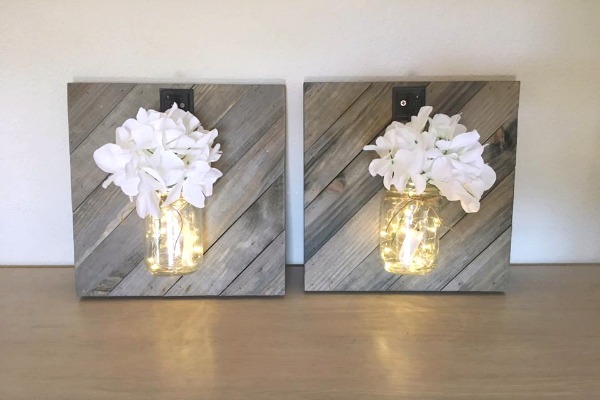 Michelle used leftover mason jars from our painted fall mason jars project and the twine leftover from last month for her project to make these wood mason jar lights. I love how both projects turned out! It was fun to be able to cross a project off both of our to-do lists too. I've been wanting herb markers for months, but Michelle doesn't have a garden. Michelle has wanted to make these lights for like a year, but I don't have anywhere to hang them. So this leftover idea really worked out for the both of us! Next month we’re going to make summer pillow covers. Although neither of us has picked our designs yet. After that, we’re open for suggestions. If you have a favorite craft, let me know! OMG! You made those!? They are INCREDIBLE!! Thanks Rachel! Everything was pretty easy to make, but some were definitely time consuming! Great post! I'll have to start keeping track of pins I try. You should! It's so fun to actually make what you pin. I try a lot of recipes too! So creative! 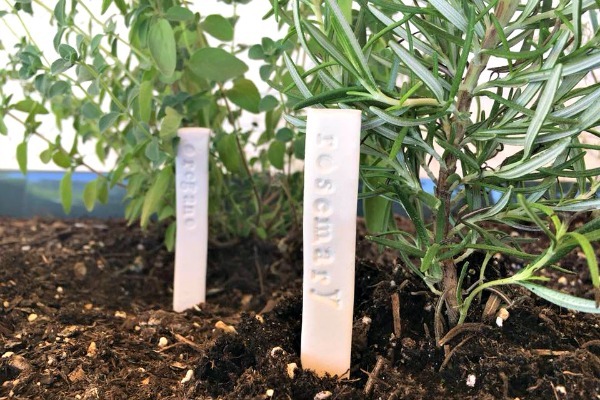 I love those herb markers for the garden! Thanks Raina! I almost bought a set on Etsy, but I'm so happy that I decided to try making them myself! I need to get some of those pillow covers from Hobby Lobby! Such a great price. Your crafts all turned out super cute! They're definitely the best place to buy plain pillow covers! Sometimes they even have them on sale for 50%-off or they always have a 40%-off coupon online!